The first half of July was certainly positive for a financial market. Stocks rallied mostly because of optimism of upcoming earnings season that is starting this week. This week’s market review is also positive, looking at interesting checkpoints of the stock market life. Trump has announced 10 percent tariffs on $200 billion Chinese goods last week and nonetheless, the stock market kept rising. Supposedly, the tariffs will undergo a two-month review process with hearings August 20-23 with taking effect earliest on September. Thus, the market is not taking this news into account at the moment. In longer-term, the tariffs should not play a big role in the portfolio if well-re-balanced. MarketWatch with Visual Capitalist has released an interesting chart saying that “perhaps the most interesting fact highlighted by Visual Capitalist’s chart is that the cost of trade has steadily been dropping, making it cheaper to buy and sell with other countries, suggesting that no matter the threats and tariffs, global trade is likely to continue growing”. The current market review suggests that an increased global growth, super low unemployment, and corporate tax cuts will very likely lift an earnings growth this year. Higher than expected earnings will result in stock prices running up the hill. Even though the stocks might seem overbought, with such catalyst as strong earnings, they will just move their price levels higher. 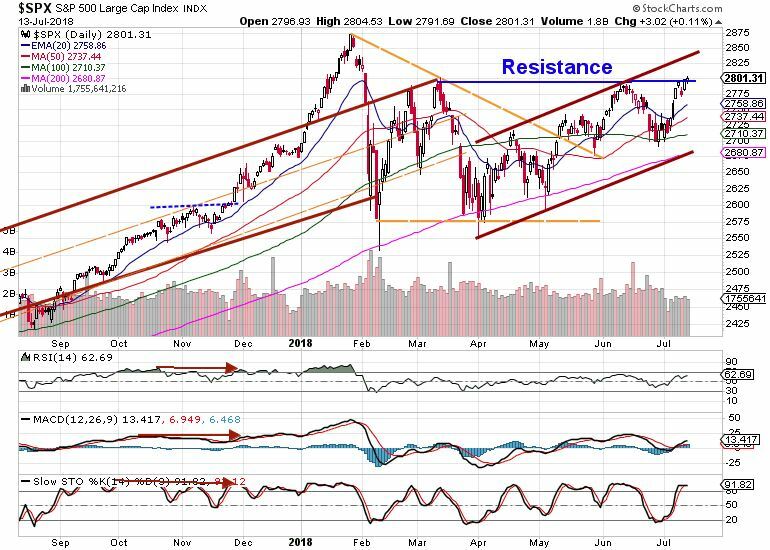 Standard & Poor’s 500 index successfully bounced from 100 MA as July arrived and recently the price landed on 4-month-old resistance. 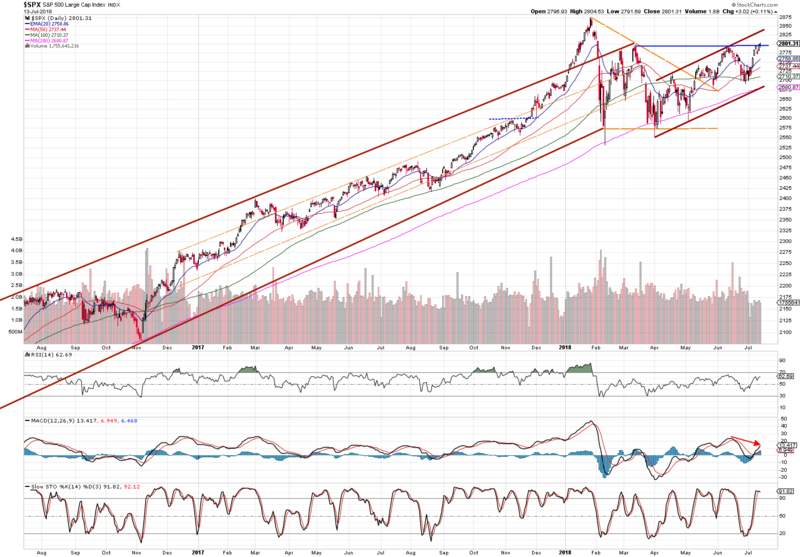 This is a good sign for the index to continue rising to the 2875 levels. Technicals are also playing in favor of the index rise. 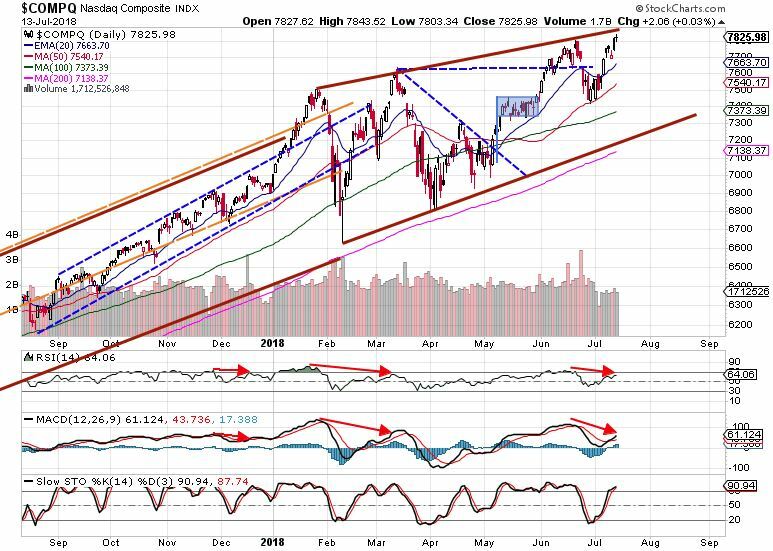 RSI is well positioned between 50 and 70, MACD has crossed the signal line into a positive territory, and Stochastics has just become overbought. 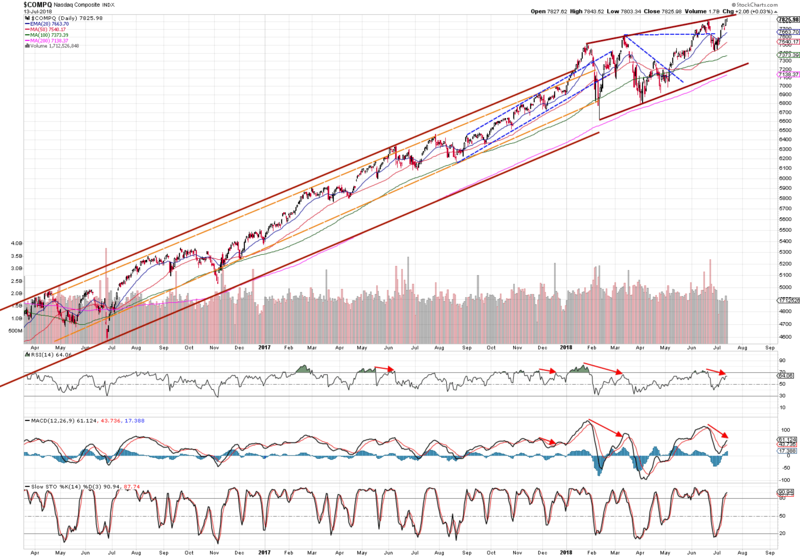 Top performing Nasdaq has recorded its highest high on Friday reaching almost to the edge of the trend channel. 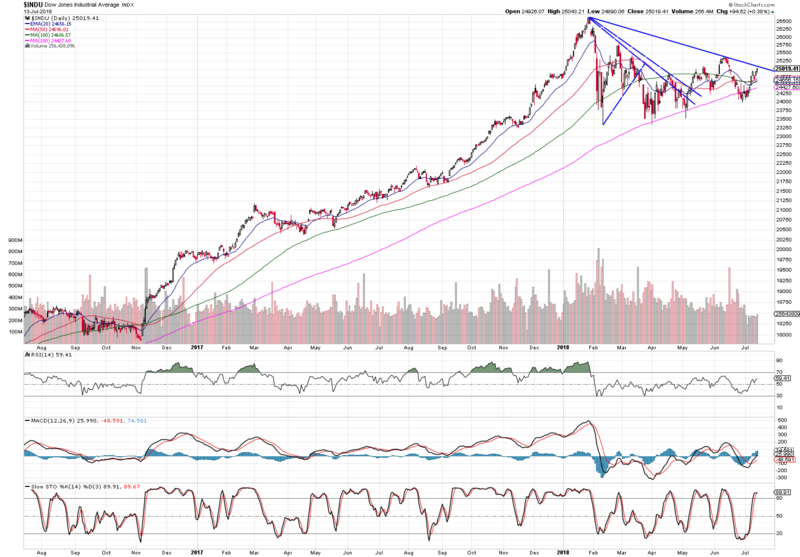 Even though it is going to rise even more and most probably break the outer resistance, there is a slight bearish divergence in RSI and MACD. On the other hand, the MACD line just crossed up a signal line which is a positive signal of further increase. Thus, the index is trending higher and its current support would be 20 EMA, where the price might be consolidating in short-term. A lagging index managed to return to a bull market by not staying below 200 SMA. 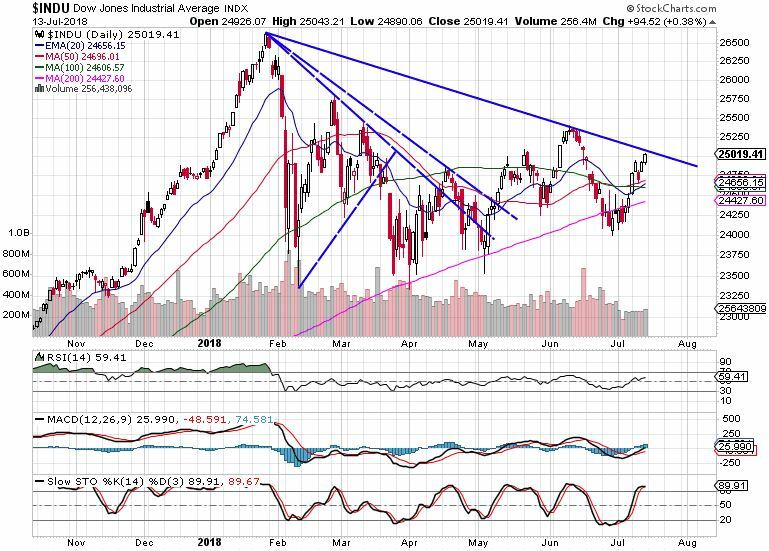 Dow is going to fight with resistance (blue line) before it can go up even more. UK’s FTSE has been consolidating from its peak recently. The price managed to break through the short-term resistance and is heading toward the support level. Let’s see how this revolves. A bounce from support would mean further price increases in the near future. A current bull market is nine years old – the second-longest bull market since world war 2. Every market participant wonders how long this will last, bears trying to find every possible reason that this a peak and will go down and bulls trying to do an opposite to explain why the price will be driven higher. Fact is that every market has its market cycle with four main stages. We believe that we are in a later phase of stage 2 – expansion. Considering that unemployment cannot be much lower anymore and interest rates are very slowly picking up, there is still room for expansion. The catalyst for the rest of the year to drive the price is going to be corporate tax cuts. The current market review does not know when exactly the peak is going to be, but it is certainly not now. The interest rates are not high enough to make investors switch from stocks and macroeconomy is doing too fine to trigger a bear market. There are sectors in the stock market that do better than others and thus, rebalancing portfolio is a crucial tactic this year. Investing in healthy stocks guarantees a profitable future even during an economic slowdown. Stay disciplined, focused on the big picture and see you in the next market review!